The relentless flattening of the Treasury yield curve has been a topic of ongoing debate -- is this a signal that a recession is near? The key to interpreting the flattening is that bond market participants are not paid to to anticipate economic outcomes (outside the corner case of the inflation-linked market), rather to anticipate the path of short-term rates (and the term premium). The flattening yield curve tells us that market participants (on average) believe that we are near the end of the rate hike cycle, but that does not necessarily mean that a recession is imminent. As an initial disclaimer, I will note that I have no analytical axe to grind on the recession probability front. I just returned from a tour of Western Canada (including the Calgary Stampede), and I have spent more time pondering chuck wagon races than economic trends for the past weeks. My bias here reflects earlier views, which may be out-of-date. Over the coming months, I will be digging into business cycle theories, and will be commenting more frequently on the current situation in light of that research. Additionally, I ran across an article by Minneapolis Fed President Neel Kashkari about yield curve flattening which is quite pertinent, but I only saw it after I put this article to bed. I discuss his comments in an appendix. Slopes are a favourite indicator of many economic observers. 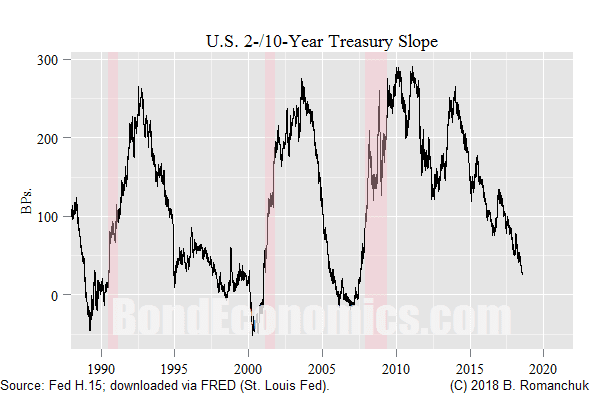 The usual technique is to pick two arbitrary maturities out of the Treasury yield curve (which is a continuum that stretches from overnight out to at least 30 years), and take the time series of the differences of yields. (I will occasionally refer to such slopes as "yield curves," such as in the title of the article. This reflects the somewhat confusing standard terminology of economists.) The figure at the front of the article is a classic example -- the 10-year Treasury yield less the 2-year yield. If we eyeball the chart above, we see that the 2-/10-year slope inverted (had a negative value) just before the post-1990 recessions. (The track record going back further is also good.) It is not surprising that economists and market strategists end up inserting yield curve slopes into their forecast models. Furthermore, the yield curve is a continuum. It is possible to data mine the the possible short/long maturity points to engineer a slope that best fits the limited number of historical recessions within a forecasting framework. The question is: how seriously should we take the models that use the slope as an indicator? In my view, we need to treat such models with skepticism. We need to go back to first principles: how are bond yields set? The reality is that realised bond yields reflect the capital-weighted positioning of bond investors. How do those (government) bond investors make money? That is a complicated question, but the first order approximation is that they need to set bond prices so that bonds and cash have the same expected return (modulo the term premium). * This is mathematically equivalent to rate expectations theory, which implies that a bond yield is equal to the average expected path of short rates over its lifetime (plus the pesky term premium). Market makers need to set prices in such a fashion that their books are relatively balanced. They may take speculative positions, but they cannot end up having all their clients betting against them, since those clients have much larger collective balance sheets. Realised yields represent the exhaustion point for bulls and bears -- neither has remaining risk capacity to push yields further in either direction. For simplicity, let us pretend that the term premium is zero at all points on the curve, and the curve is perfectly flat. (I return to the non-zero case later). What would that tell us? As a result of arbitrage arguments, all we know for sure is that for any maturity, 50% of the probability-weighted average path of short rates is greater than or equal to the observed yield, and 50% of the distribution is less than or equal to that value. or a 50% chance of a 1% average, and a 50% chance of a 5% average. There is a world of difference between case #1 and #3; the first outcome implies guaranteed short-rate stability, while #3 guarantees that there must be a major move in either direction. Meanwhile, the payoff is expressed in terms of short rates. There is no guarantee that movements in short rates will correspond to any economic outcome. In particular, in the case of the current flattening, the safest interpretation is only that it tells us that market participants (on average) believe that the rate hike cycle is near an end. We cannot translate that into an assumed rise in the probability of recession for two reasons. Market participants could be wrong about the probability of rate cuts (normally associated with recessions). The Fed could stop rate hikes in the absence of recession. Most economic models allow for the possibility of steady state growth, with a constant rate of interest (an outcome that manic-depressive market commentators prefer to ignore). The second possibility is interesting from a business cycle analysis standpoint. The previous three cycles were extinguished by the financial travails of over-extended borrowers (the Savings and Loan debacle, the telecom bust, then the Financial Crisis). The Fed was focused on the output gap and inflation, and ignored the financial strains in the economy. As a result, they tended to hike rates pretty close to when the recession started. The Financial Crisis has caused enough changes in behaviour (both in the private sector, and by the Fed) that there is a plausible story that rate hikes might stop long before the recession hits. This would break recession models that implicitly rely on the close proximity of the end of rate hikes and the start of the recession. We may have entered a regime where the 2-/10-year slope effectively contains no useful economic information. There's a chance that the Fed might hike a few more times than forecast, which is counterbalanced against a low probability of recession (for example, a 20% chance on a one-year horizon). Models that suggest low probabilities of recession are essentially non-testable with the data that we have available; the economy will undergo structural shifts long before we accumulate enough data to test the model (and the people who proposed the model will be retired before the conclusion of out-of-sample testing). In any event, we cannot look at a slope and draw conclusions about market participant beliefs. The flat curve could either represent a consensus that rates are on hold forever, or a clash between extreme views that are perfectly balanced. Looking at the discussion above, the addition of option prices should be able to add information. We can infer a market-implied probability distribution for the path of rates. We could then assume that extreme rate cuts correspond to a recession, and thus back out a recession probability. The concern I would have with that angle of attack is that fixed income option pricing can be driven by the supply/demand situation for callable bonds. In the United States, this is dominated by the supply of conventional mortgages. There is no reason to believe that mortgage demand by households is driven by a view on implied volatility. We might need to stick to short expiry options on short-dated underlyers to avoid the contamination from this supply effect. For example, usage of eurodollar futures options could be used to back out a rates probability distribution over a 1-2 year horizon. The question is whether that could be extended further into the period between the 2- and 10-year maturity without the distribution being driven by mortgage hedging needs. If we were to believe the academic consensus, the term premium charges around like a drunken chuck wagon driver. In fact, under some estimation techniques, the term premium is more volatile than rate expectations. If this were indeed true, the slope could contain almost no useful information, since it would be driven by the differential in term premia at the two chosen maturities. That is, the fall in the 2-/10-year slope could be driven entirely by a collapse in the 10-year term premium relative to the 2-year premium. The implication is that investors believe that the Fed will hike rates more than forecast, but refuse to put on a relative value trade (a 2-/10-steepener) to take advantage of this apparent mispricing. I leave the plausibility of that interpretation to the discretion of the reader. All we can safely conclude from the flattening yield curve is that the weighted average investor believes that we are near the end of the rate hike cycle. This could be consistent with a near-term recession -- or being stuck in steady state limbo for another decade. Minneapolis Fed President Neel Kashkari wrote "The Flattening Yield Curve," which has forecasting conclusions quite different than the tone of my article. Kashkari's full time job is economy watching, so I am not in a good position to dispute his views. However, I believe that there are some hidden assumptions in his logic, and if we make those assumptions more obvious, there is not a great deal of contradiction in views. The primary reason some policymakers argue that this time is different is because the “term premium” is low today, and so they argue that comparisons to past yield curve inversions are misplaced. I largely agree that arguments involving highly mobile term premia are the last refuge of scoundrels. Update: Mayank Seksaria also observed that there are models/theories that suggest the term structure of the term premia will be directional with implied volatility; a fall in implied volatility would accentuate curve flattening under this view. Although I accept that falling implied volatility could result in a somewhat flatter curve than otherwise would be the case, it cannot be the only explanation. If the curve is too flat relative to my fundamental views, and the options market suggests that there is little uncertainty for the path of rates, I would be more likely to want to load up the truck with steepener positions. That said, I disagree with the implications of Fed rate hikes. Kashari is implicitly assuming that bond market participants (in aggregate) are highly confident in their expectations for forward rates -- and thus those forward rates will remain fixed even if the Fed hikes rates more than forecast. Conversely, I argue that it is unclear that anyone has that strong a conviction on the path of short rates. Unexpected rate hikes could easily cause a parallel shift in the entire yield curve, leaving it just as flat as it is now. As I argued above, a flat yield curve does not convey a lot of information about expectations for the next movements in rates, and so the Fed may be able to push the bond market around to its point of view. This is hardly unprecedented. In 2010-2011, the consensus view of bond market participants and commentators was that short rates were unsustainably low, and that the Fed would have to quickly renormalise rates. However, the Fed stood its ground, and after another few years of this, the bond bears threw in the towel. The relationship between market rates and the administered policy rate is complicated, but the Fed still has the bully pulpit. If the curve inverts, long duration positions are negative carry. Unless bond investor have a strong opinion about near-term recession risks, it would be painful sitting in negative carry positions, particularly if the Fed remains on the hiking band (chuck?) wagon. * Getting the level of bond yields right is the duration call, and investors' collective track record in getting duration calls reliably correct is poor. As a result, most fixed income investment research effort is aimed at relative value. However, bond investors generally will take a stand on duration once yields get too far away from their estimate of fair value.